What!? Rain? You have rain here? Like not the fluffy white magic but the wet, soggy dampness?? Oh…..ok. That is NOT what we talked about but I suppose seeing as I am in the market for a family I shouldn’t be whining all that much. At least its not southern California weather – ugh. Well a little about myself for those of you looking for a girl who is delightfully curvy and deliciously sweet. 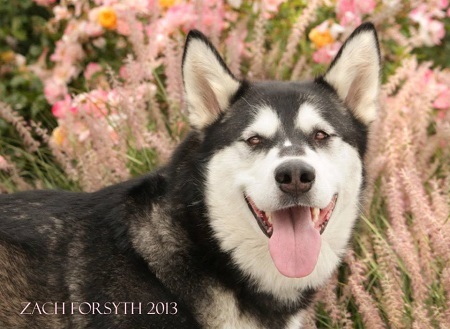 My name is Zephyra a 2 year old Malamute and let me be the first to tell you that I am whole lotta lovin’ in this big ‘ol body and while I am built like a sumo wrestler my manners are those of a dainty lady. I am a complete mush with my friends and sometimes I get the zoomies and race around the play yard and I have heard the peeps at Pixie say it is just about the cutest thing they have ever seen! I am one year old I am good with other doggies, I am gentle with everyone I meet and I am generally just a staff favorite and an all around awesome girl. Just because my breed is one that has a history of being chasers a home without felines is preferred. If you would like to meet me please fill out an application at pixieproject.org and then we can get together and cuddle! Whooop whooop! I am fixed, vaccinated and microchipped. My adoption fee is $250.